Education for teacher in Arts and Art History at Fontys Academies Tilburg (Nl). Graduated in 1989. Since 1993 his work is shown at many exhibitions in galleries, museums and art fairs Van Hoef’s travels are of vital importance to the devolopment of his art. Since 1992, he has often visited Spain and Italy, but the most important destination within Europe is Berlin. As part of his education, he travels there in 1988 (a year before the collapse of the Berlin Wall). In 1991, this trip brings forth its first fruits; his fascination for the continuous metamorphosis of this city proves inexhaustible to Van Hoef and leads him to return there yearly to work for short periods since then. The fascination with the aspect of “change” gives rise to a number of trips to areas in Central Asia. A common feature of the destinations is the process of change (whether political, social, economic and/or cultural) that the areas, both recently and in long-term historical context, have undergone. In 1995, he traveled by Trans-Siberian Express and visited areas in Russia, Mongolia, and China. Also of interest were trips to countries along the Silk Road route (1996 and 2000), such as Uzbekistan, Kyrgyzstan, Pakistan, Northwest China, and the Middle East in 1999 (Syria, Lebanon and Jordan). 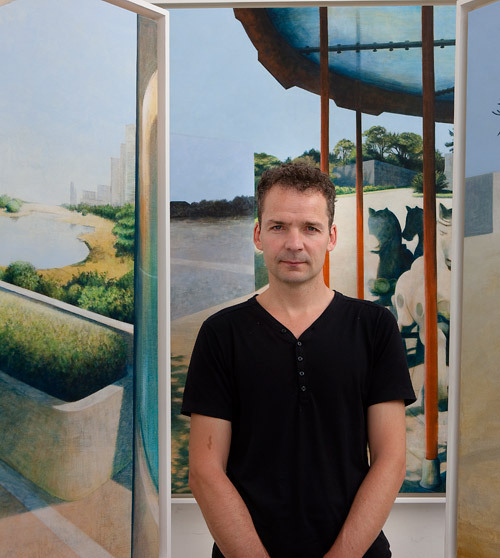 A stay in Hong Kong in 2006 caused a change in the thematic focus of his work. As a result of this change, the destinations in recent years have focused more on dynamic, modern cities such as Tokyo, Dubai, and Kuala Lumpur and Singapore in 2014. The recent paintings show the urban landscape without involving a classical view of nature. The works show a perception of reality that is artificial, manipulated, and constructed.